Biological studies are often performed on large populations of cells, providing averaged information about the population. However, within a given population, the cell-to-cell variation can be dramatic and may influence the health and function of the entire population. Thus, studying the response profile of cell populations at the single cell level is crucial to gaining a better understanding of fundamental biological processes such as signaling pathways. The development of such single cell methods may lead to advances in diagnostics and treatment of a wide range of diseases. Single cell techniques are also useful for studying rare cells of interest, such as stem cells or circulating tumor cells. In this case, methods analyzing entire cell populations do not provide meaningful information, as the results from the limited number of cells of interest are lost in the averaged response. The use of multiple analysis techniques on the same cell, allowing measurements of both proteins and mRNA for example, could provide great insights on gene expression processes. Figure 1: HL60 Cell (Human promyelocytic leukemia) cells stained with Cytrak, 60x objective. The nucleus appears as the brightest part of the image, while the cell membrane presents a lower fluorescence signal. In any single cell analysis study, it is essential to isolate individual cells of interest in small volumes. Small volumes are required so as to keep the concentration of the analytes as high as possible after lysis of the cell. 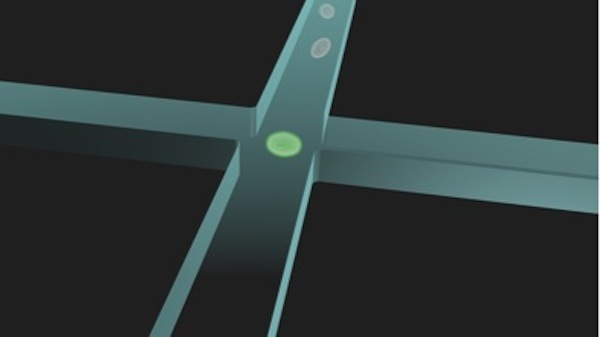 Microfluidic devices enable the actuation of very small volumes, particularly adapted to single cell isolation techniques. 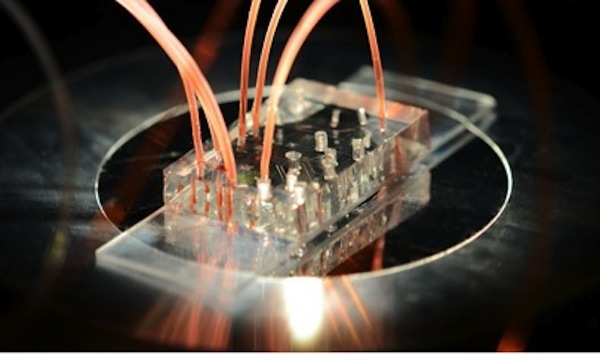 We are developing different microfluidic systems to select and isolate single cells of interest. Once isolated, the aim is to lyse the cells in situ and to capture the content on functionalized beads. This platform will be used to extract and capture any molecule of interest from single cells such as DNA, mRNA, and proteins. 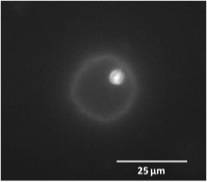 The beads used to capture the biomolecules will then be analyzed downstream by the single molecule detection techniques developed in the lab. We are developing a microfluidic device based on a multilayer platform (Figure 2). Adding a control layer to a classic microfluidic device creates valves, called Quake valves, which can actuate small volumes of solution, in the nanoliter range or less. The device we are developing includes a sorting area (Figure 3) where the cells of interest can be selected by size or fluorescent signal. Computer-controlled solenoid valves actuate the microfluidic valves to sort the cell of interest into one of the isolation chambers. Once in the chamber, the contents of the cell are captured by functionalized beads, which can then be analyzed.